The embattled head of the Fight for $15 movement resigned on Monday amid a sexual harassment and nepotism investigation. Scott Courtney tendered his resignation to Service Employees International Union (SEIU) on Monday, one week after the union first suspended him from his role as executive vice president. Courtney was a top union officer and spearheaded the campaign to raise the minimum wage to $15 an hour, while taking home a compensation package of $230,000 in 2016, according to federal labor filings. A union spokeswoman confirmed a Buzzfeed report that SEIU President Mary Kay Henry accepted the resignation on Monday. "There is no place in our organization for conduct that violates our Code of Ethics. Such conduct does not reflect who we are or represent the values that guide the important work we do every day for working people, our families, and communities," Henry said in a statement. The complaints from female staffers alleged that Courtney maintained sexual relations with underlings who went on to receive promotions. Courtney has yet to address the controversy, declining to comment on an initial Bloomberg report of his suspension because he was on his honeymoon after wedding a union staffer. Fight for $15 made sexual harassment in the restaurant industry a central theme in its campaigns. Labor advocates say those workers are more likely to experience such harassment, especially those workers who rely on tips for the majority of their livelihood. The culture of sexual harassment at the union, which has among the highest female membership in the country, extends beyond Courtney, according to a former organizer. The ex-organizer, who spoke to the Washington Free Beacon on condition of anonymity out of fear of retaliation, said two supervisors sexually harassed her while at the union and working on behalf of the Fight for $15 campaign. She said their behavior continued even after she filed complaints; both were later laid off, but she emphasized it was unclear if that was related to her reports or general cutbacks. SEIU has announced plans to scale back its staff levels by 30 percent following the 2016 election. "At several progressive workplaces I've been at, I saw folks have a really hard time matching their personal behavior and what they do with their progressive ideology," she said. 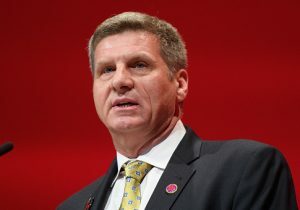 The union emphasized that Courtney's resignation will not terminate the investigation into the allegations. "The internal investigation will continue and President Henry has taken additional steps to ensure that, across our union, all staff are respected, their contributions are valued, and their voices are heard," the spokeswoman said in a statement. SEIU did not respond to follow-up questions about how complaints of less senior personnel have been handled.